After the unspeakable tragedy in Newtown, Connecticut last Friday, it seemed like a perfect night to be together as a family and make a good memory for the kids. Santa helped us achieve this goal. 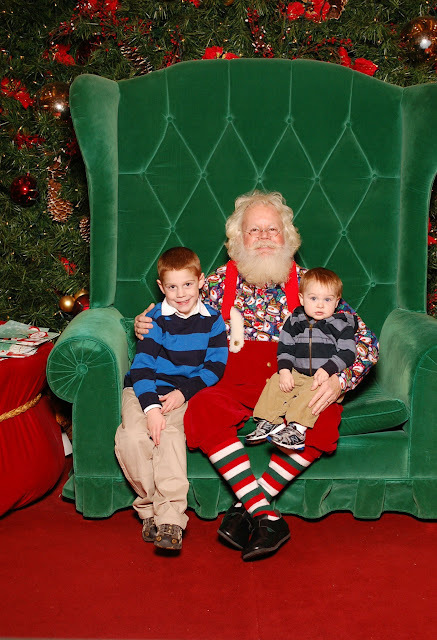 We had a nice night out with the boys and visited with, in my opinion, the best Santa Claus around at Jordan Creek Town Center. The boys were excited to see Santa (well, Holden was at least - Maddux didn't seem to care one way or the other), we were able to get a nice picture to commemorate it and Leah and I were able to do something other than sit around watching the news asking ourselves "why".